The Fox is a controversial issue with many. Some see them as a Pest, some see them as welcome visitors. The main problem has been their population, there are too many? Maybe so, but those who see them solely as a nuisance should maybe understand that their over running of some areas is due to species man himself. Some people don't take any care in their domestic waste disposal, they overfill bins, leave plastic bags with food in them next to bins and some Authorities are pretty bad at leaving a lot of the Rubbish on the ground and don't take action upon those who make the mess in the first place. I see them as beautiful creatures and have every right to share the environment with us. I keep Chickens in the Garden as do many others. I see many folk verbally slaying the Fox for taking their Hens, but if they have done so, it's our fault in not protecting them enough. Chicken's life's are in our hands and like every living being, the Fox has to eat to survive. Farming is another issue and I don't intend to tell Farmers what they should and shouldn't do! Being pretty much rural we're not over run with them, but I know they're in my Garden every night; I hear them playing, I hear them mating and I hear them fighting. The average rural Fox will probably not see further than 3 or 4 years whereas an Urban Fox, because they have more food resources (bins and man's food spillage habits) can obtain 7 years of age. After Cubs are born between late February and April, then spend the Spring and Summer month's with their parents and in training for leaving home. They leave, or get pushed out, in late Summer to seek their own territories (no more than3 Cricket Grounds in size). It's during this period you hear more fighting and also observe more road kill. To the human and indeed to other species, they are not of much use, maybe the reason we don't like them is we can't eat them or put them to work? 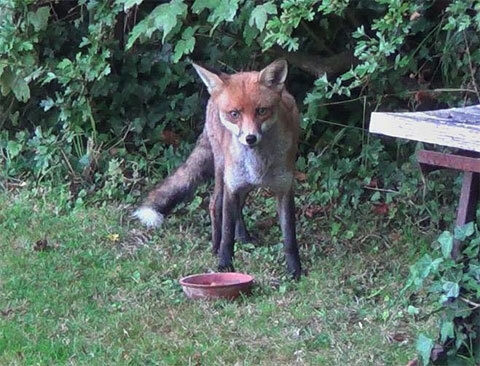 So love them or hate them, you have to give them ten out of ten for survival, foraging instincts and the amazing ability they have for out foxing us !! 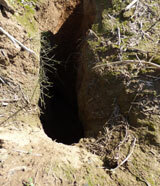 The hole is about 12" (0.3m) in diameter. The Fox rakes out more soil on a regular basis. Have you Foxes in your Garden and don't realise? Go to the Animal Droppings Identification page. PS. Don't worry too much about your Pet Dogs and Cats, they both are very good at seeing any Fox off.